From the founders of Hardywood, Richmond’s newest craft brew uses real fruit to bring the light, sweet taste of the great outdoors to adventurers everywhere. 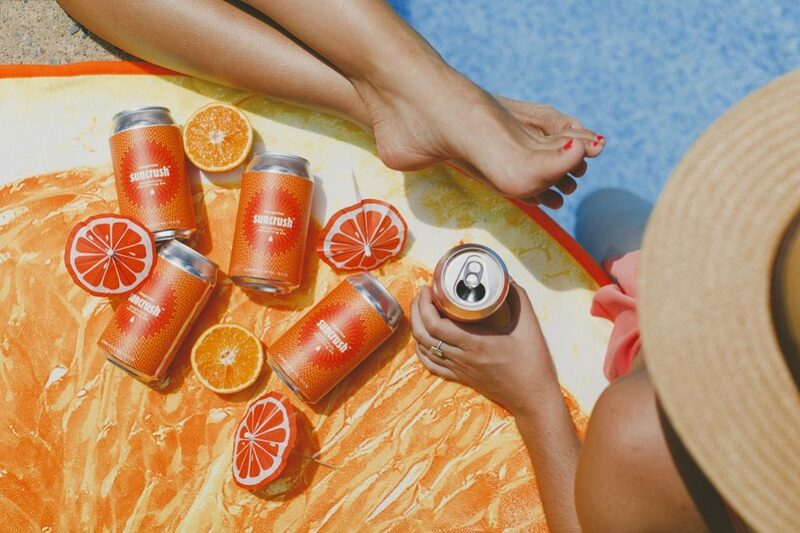 Hardywood Park Craft Brewery founders Patrick Murtaugh and Eric McKay have brought sunshine to Richmond in beer form, launching their new brand, Suncrush, in Virginia last week. When Murtaugh and McKay returned from weekend trips with Great Return, a strong and bitter IPA, they agreed that it hadn’t been well-suited for long days on the beach or hiking in the mountains. “And so, we started thinking about the ideal beer to have for any outdoor adventure,” McKay said. With cornerstone attributes in mind, they crafted a beer that was low in alcohol, carbs and calories, and had natural caffeine and antioxidants from the green tea and real fruit components. After eight months or so of Murtaugh brewing and tweaking pilot recipes, they settled in on the recipe found on shelves today. 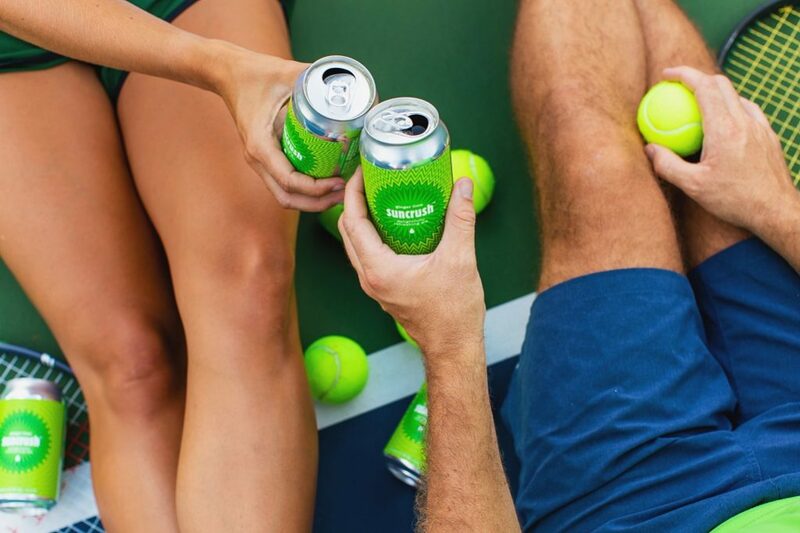 Because Suncrush serves as a strong brand on its own, Murtaugh and McKay decided to separate their new brand from Hardywood to appeal to a new wholesale environment: grocery stores. Hardywood is intended to have a billboard effect, where multiple Hardywood brands can be seen side by side on the shelf so that customers shopping for Hardywood can see all of the beers together, McKay said. Suncrush is for people who might typically reach for a hard seltzer. This new beer brand, however, is also another option for customers who may be avoiding gluten in their diet, or might find seltzer drinks to be too watery and lacking in flavor. Before launching Suncrush in Virginia, McKay and Murtaugh tested the waters at their taprooms in Richmond. Although it wasn’t heavily promoted when it was first made available, it quickly became one of the best-selling beers in the taproom, Murtaugh said. “Our taproom has been a great place to test-market various varieties that we produce to find things that really resonate with people,” Murtaugh said. about the new line of products. Suncrush may even be sold past Hardywood’s current distribution footprint. 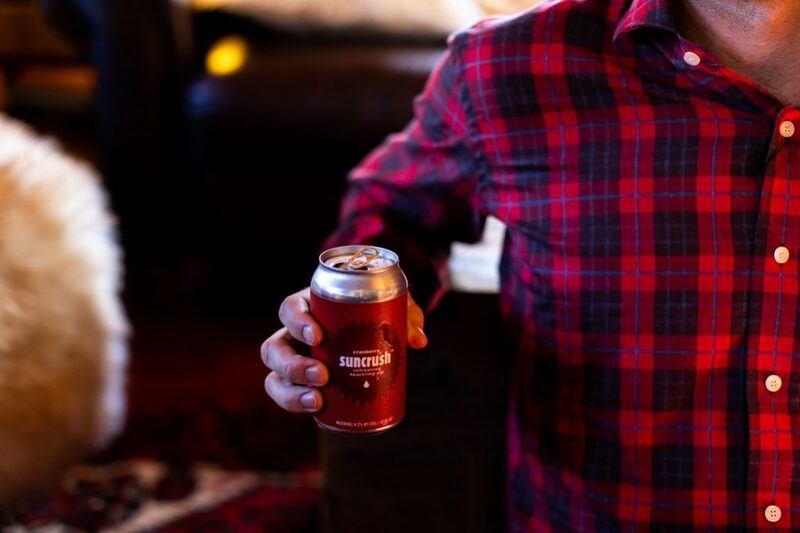 Locally, however, Murtaugh and McKay said that they had designed Suncrush to be good for grocery stores, convenience stores, and event venues — including places where Hardywood is yet to be sold. A main difference between the Hardywood and Suncrush lines of beer is where ingredients are sourced. In order to use high quality crushed fruit, some Suncrush ingredients are sourced from Oregon. This variation in production was another factor that encouraged McKay and Murtaugh to separate the Suncrush and Hardywood brands. The fruit component of the beer makes it especially challenging to adapt to seasonal flavors — which are a cornerstone for the brand. Although Suncrush may be the ultimate beach beer, Murtaugh and McKay aim to offer flavors reminiscent of colder seasons as well. Murtaugh and McKay can be found enjoying their own beers straight off the slopes or after a good hike. “It makes you feel good about drinking a beer after a workout,” Murtaugh said, after describing that moment when you get to the top of the mountain and crack open a beer while enjoying the view. McKay brought the cranberry and tangerine brews on his most recent ski trip, citing their popularity among his friends. “Everyone agreed that they were the perfect after-a-ski beer,” McKay said. No matter the spring adventure that lies ahead, there’s a Suncrush beer to celebrate with. Flavors to look forward to: lemon raspberry, grapefruit, ginger lime and southern peach. *This is a Pho Eating Contest – one of kind, Champions of all Champions. Its Pho King Time for us to honor our past Pho King Champions, and crown our new Pho King or Pho Queen!! Mekong Restaurant hosts the Annual PHO KING (eating) contest on Feb 3th 2019 at 4pm right before the Superbowl as we always do. Please come out to support your favorite contestants, have some amazing brews, have some amazing Pho, and enjoy the Superbowl! Last week, we started into spooky brews and fall flavors as the summer ends. We’ve got more coming up on the Halloween theme, which is music to my ears, and a few warm weather beers to finish out the season. 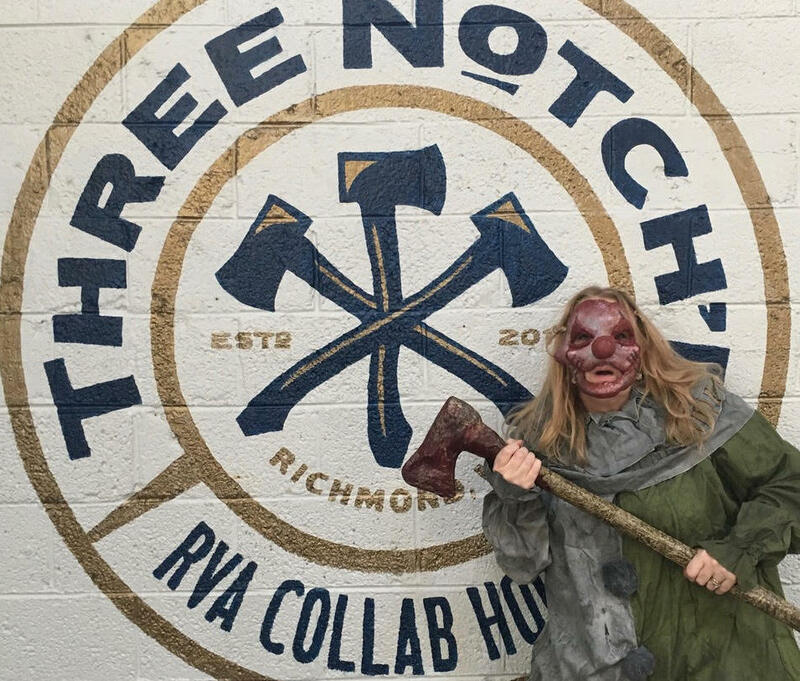 PHOTO: Three Notch’d Brewing Co.
Stoked to see a good blood orange flavor outside of drinking a San Pellegrino this week (Prickly Pear is the unsung hero there, y’all) with Three Notch’d Brewing Co.’s Scream Forest Blood Orange IPA. The Scott’s Addition brewery dropped this new beer last week and had a blast with the photo shoot. It’s brewed in collaboration with Creepy Hollow Scream Park, which, upon further investigation, looks like an awesome haunted house for most adults and about a week’s worth of nightmares for me. Scream Forest is dry hopped with Mosaic hops for a hearty orange favor that’s “bloody delicious,” so swing by Three Notch’d and give it a try. *Lab coats not included. Our friends at Legend Brewing Co. dove into history last weekend with this Norfolk Experiment Imperial Stout. According to Legend (nice), the folklore behind this beer is based on a rumored U.S. Navy experiment during WWII about teleportation and time travel between Philadelphia and Norfolk on the USS Eldridge. In response, the Navy said, “What time travel?” — so conspiracy theorists, now’s your time to shine. Norfolk Experiment as a beer sounds like a great chilly weather drink, full of coffee, dried fruit, toast malt, and warming alcohol. This 11.6% ABV stout sounds about as intense as its folklore. The Answer Brewpub released a major throwback this week with this 80’s Mike Tyson arcade game-inspired IPA, Let’s Get Physical. The collaboration beer with Calusa Brewing from Sarasota, FL showed its roots with fruity Citra and Cascade hops in the kettle, then dry hopped with more herbal Galaxy, Motueka, and Mosaic. It’s “silky smooth” and it’s straight out of Mike Tyson’s Punch-Out! !, a 1987 Nintendo boxing video game which had such a cult following to which it’s still revealing secrets 30 years later. 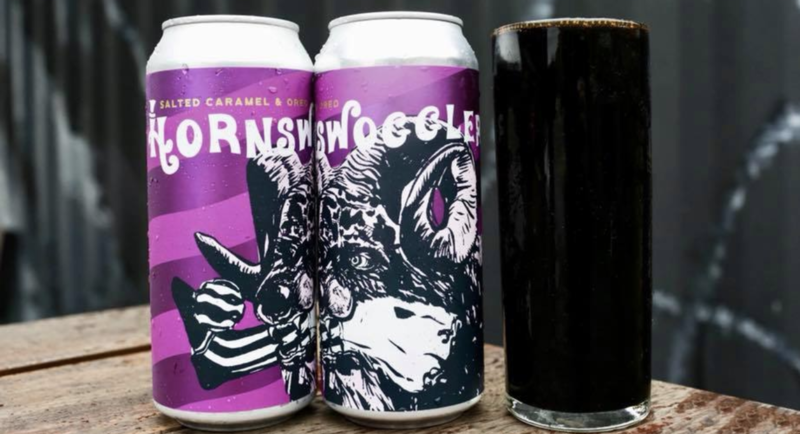 The Veil brought new meaning to cookies and milk this week with their Salted Caramel + Oreo Hornswoggler, a robust chocolate milk stout complete with actual salted caramel and Oreo cookies. It’s making me hungry, and you can check it out this Saturday at their Lager World event for the brewery’s first Oktoberfest-style jammer. They’re also releasing Deathless, a Märzen Lager brewed over three months and fresh to the taps this weekend. Over at Ardent, another end-of-summer brew is on deck with Plum Gose. The wheat-based, kettle-soured gose is perfectly pink. It comes with a touch of saltiness and a pleasant acidity, according to the brewers, in true gose style. Also fresh at the brewery is the collab Baltic Porter with Precarious Beer Project. Taps are running out on the Williamsburg porter visiting RVA, so get ‘em while you can!